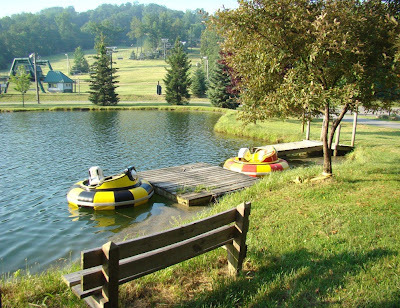 My absence from blogging for the past few days was because I was an instructor at an Adventure Camp for 8-15 year olds. My session included hiking, wildlife identification and nature awareness. It was a lot of fun, if not quite what I’d planned. The kids seemed to be having a lot of fun, though how much they actually learned is up for some debate. 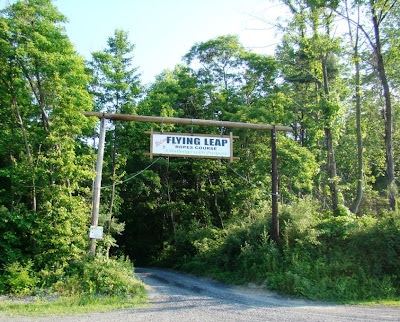 I had 3 different groups of kids and took each for about a 2-mile hike down the mountain at Roundtop. There, we walked along an old woods road along Beaver Creek and then hiked back up the mountain to the camp. By the third trip up the hill, in what was by then 90 degree heat, I was ready for the day to end! I’d dutifully started each hike with a list of what to take when hiking and a tally of what not to do in the woods. Some of my instructions, like being quiet so we’ll see more, didn’t make it past the first 100 yards. The kids really weren’t interested in things they couldn’t touch—like birds. Seeing four species of ferns really or even a very pretty little wildflower wasn’t up their alley either. But, things like picking raspberries, now that was okay in their book. The only real problem is that the raspberries are just now ripening and there weren’t always enough to go around. So, despite my pleas to only pick the black ones, I soon was besieged by one child after another holding up a single, pathetic-looking raspberry in various stages of unripeness and asking me if this one was okay to eat. Eventually, we passed enough raspberry bushes that every child was able to taste at least one ripe one. We did find some fun things along our walk that the kids were thrilled with. Unlike the deer and the birds, a box turtle was simply too slow to be able to hide until my little armies were past. Poor turtle was handed from child to child, turned over (again despite my pleas) and inspected thoroughly before being reluctantly released. Turtle was long gone by the time the next group walked through the same spot. One group discovered a small salamander, an Allegheny Mountain Dusky Salamander. I hope the poor thing survived. It was discovered under a rock and passed from child to child and eventually dropped, though not stepped on. The species is (fortunately) abundant and tends to be more terrestrial than the average salamander. Assorted frogs leapt into the ponds in terror whenever one of my roving tribes neared. Usually the frogs de-camped long before I could identify them. One counselor caught a black snake that was about 4-5 feet long, and the kids all got to touch that, which was a big deal. Insects of any species, if they were of an unusual color and could be captured, were objects of much enthusiasm. Dragonflies were only of passing interest, as they were colorful enough but couldn’t be caught. All in all it was a fun experience, though I wish the kids were a bit more, um, focused. I can’t honestly say they really learned much, though most of them seemed to be having fun. In three weeks I get to do it all over again. I just hope the mountain recovers by then. Expect no blogging here for a day or so. I'll be offline and teaching nature awareness and hiking to kids at an Adventure Camp for a bit. I'll be back by Monday at the latestwith stories from how that all went, as well as the latest news and ruminations from the cabin. New summer flowers are beginning to bloom around me. The spring ones are gone, and summer’s blooms are just getting going. 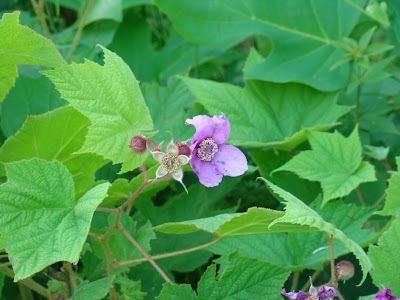 Today’s photo is a purple blooming raspberry (also known as purple flowering raspberry and thimbleberry). The flowers are very showy, aren’t they? Showier than the fruit will be, actually. I think the maple-shaped leaves are very pretty, too. 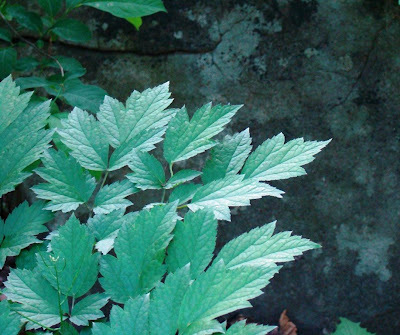 The plant is actually a member of the rose family (rubus odorous). The fruits aren’t usually eaten as they are extremely seedy, though they have a nice flavor with a bit of a tang. The berries won’t be ripe until the end of August or so. My morning started off with a bang, well, actually a bark. Baby Dog has seen the fox again, and in nearly the same spot as she did last year. We had just finished walking through the woods and were heading out onto one of the slopes, when we both saw the fox at the same time. It was perhaps 50 yards away, sitting out in the open at the edge of the slope. We watched it bark. Then it barked again. Baby Dog returned fire and barked back at it. The fox barked again, still sitting there looking very doglike. Baby Dog, whose voice, by the way, is considerably more impressive than the fox’s, barked back at the fox. At this point the fox decided it was time to head out, so it turned tail and headed back up the slope. Baby Dog tried to follow---at least until she reached the end of the lead. One thing I’m sure of is that now I’ll never be able to get her to walk past this spot without stopping to look for the fox. She’s been stopping here nearly every morning for the past year since her last fox sighting. No, I don’t have photos of our fox encounter. Sorry. I learned early on that a dog in one hand and a camera in the other do not make a good combination. 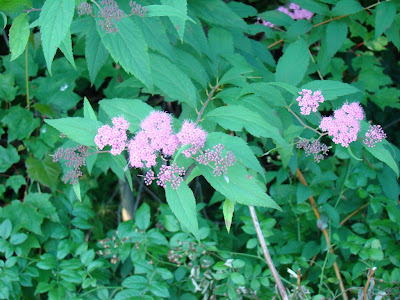 Purple Ironweed, also known as wild butterfly weed, is starting to bloom. One of the reasons I like ironweed is that simply when it blooms. In the first blush of spring, lots of tiny and pretty things are blooming, but not ironweed. Perhaps the plant "knows" it can't compete with those blooms. Right now, wild blooming things are in shorter supply than they were earlier in the season. 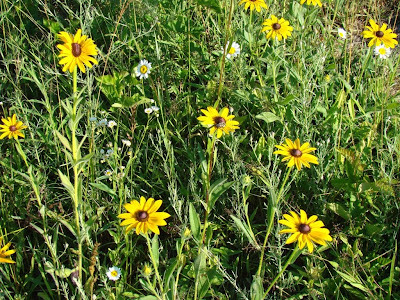 Oh, the daisies and brown-eyed susans are out, but they are sun-loving, edge-of-the-woods dwellers. Ironweed prefers moister, darker areas, like the shady side of a ditch. Last year I posted a photo of Ironweed on June 27. I don't think that means ironweed is blooming earlier by three days than last year. It likely just means that last year I waited until the blooms were fully developed before I posted a photo. Can you see the bee in today's photo? It's on the underside of the blooms. After all the talk of honeybee colony collapse disorder, I'm glad to see any bee, though this one is a little bumblee and not a honey bee, but still. I first saw these blooms yesterday evening, and I'm pretty sure they weren't this far along yesterday morning, so the blooms are pretty "fresh." Last night a thunderstorm rumbled through, though I only caught the edge of it. Missing the worst of this area's storms has been a common theme at the cabin for the past month or so. It's starting to make me anxious. I keep wondering when I'm going to take a direct hit and how bad that will be when it happens. Last night the closest lightning strike was half a mile away but most strikes were a mile or more away. That was close enough to send Dog onto my bed. He really dislikes thunderstorms. They're the only thing I've really seen him afraid of, and he always retreats to someplace safe when one is overhead. They're also the only time I allow him on the bed, and I'm starting to think his fear of them has as much to do with wanting to be on the bed as anything. He's a very tricky Dog. I know many people actually like summer, but for me it’s simply the dull time between spring and fall migration Oh, I can find some interesting things to enjoy about it—the arrival and growth of new baby birds, for one. The house might actually get straightened up to some extent in this lull time, but mostly I am waiting for the first migrants to head south again. This weekend I hiked around the cabin a bit, surprised to notice that it is almost as dry as August right now. Grass is brittle under my feet, and bare patches of ground show through where I wouldn’t expect to see that in June. This weekend my area was under a severe thunderstorm watch or warning most of the time, but here on Roundtop nothing really came of it. Friday night I had about 15 seconds of pea-sized hail, followed by 30 seconds of heavy rain, and all the while I could see the sun shining to the west, but that tiny bit didn’t improve the overall dryness any. By Saturday evening any spot that sees much sun was sun-baked again. In the forest under the protective canopy of the leaves, the vegetation seems much the same as ever, or at least not affected by dryness the way areas in the open are. 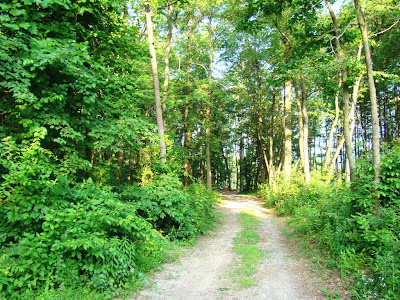 Most of the blooms of spring are gone, and the forest has settled into that deep green shade of mid-summer. The deerflies were not in evidence this weekend, so Dog and I enjoyed walking down whichever woods road we happened to find beneath our feet. We stick to these roads now; the underbrush will be too dense for much wandering until fall. And so we wait, with me counting down the days until the air is crisp again and the birds will fly. Last night I had a visitor who left a path of destruction This morning when I stepped outside I was greeted by updumped plants and a trail of potting soil that led into the forest. I suspect my overnight vandal was a raccoon. I didn't hear the disruption, though Baby Dog woke me up in the middle of the night with her barking. Since Baby Dog barks if the wind blows, her barking is no reason to suspect trouble. She's like the boy who cried wolf in that respect. Except that she's a girl and is a bit of a wolf herself. 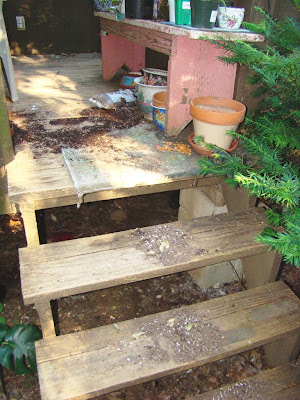 So it was a surprise to me to find the front deck in such disarray this morning. I haven't had raccoon vandals in some time. I expect this won't be their only visit. Once they begin a rampage, it usually lasts for a while before they lose interest again. I only hope the plants survive. Brown-eyed susans are as much a flower of the early summer here as yesterday’s daisies. The two often grow together, too, with the wild edges and banks all displaying a pretty variety of summer color right now. Summer’s morning light is not too harsh for these beauties, and the golden light of early morning only enhances their color. To me, it feels now as though summer is settling in for the long haul. The hot weather of two weeks ago already feels like a distant memory, and the cooler weather is much appreciated. Still, the place has the feel of summer. Sometimes I think it’s the light of a season that makes me sense when that season has arrived. The quality of light that surrounds me at any given moment isn’t usually something I’m usually conscious of, but when I look at photographs I’ve taken in winter, the first thing I notice is how weak the light seems. This weekend is the summer solstice, and although the hottest weather of this year is still 4-6 weeks in front of me, the light will already be turning towards the dark time of year and winter. But for today, the brown-eyed susans face the light and bring me joy. Whenever I start seeing daisies around the edges of Roundtop, I know the first burst of spring is gone and summer is here. The daisies and brown-eyed susans have been gracing the unmowed banks and slopes for about a week now. They grow wherever it suits them and create their own garden, without "help" from humans. 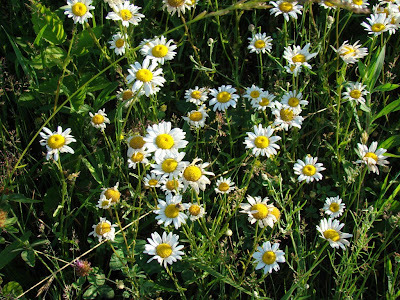 Wild they may be, but daisies are a communal plant that usually prefer the company of their own species. And it is that tendency that suddenly turns every unmowed, sunlit space into a little patch of nature’s own garden. There are many of this wild "gardens" around right now. The sides of the one bunny hill are so full with daisies that it looks almost as dense as a planted garden. Flowers always brighten up my day, even a small handful of cultivated flowers in a vase. Seeing daisies everywhere I walk is like being surrounded by hundreds of sunny smiles. Who can resist? Today's photo looks like something I'd publish around the winter holidays, but this post is not about that. I was walking around one of the ponds at Roundtop last evening and suddenly realized how dense this year's cone crop is. Once I started looking around, I saw green pine cones everywhere, tons of them. 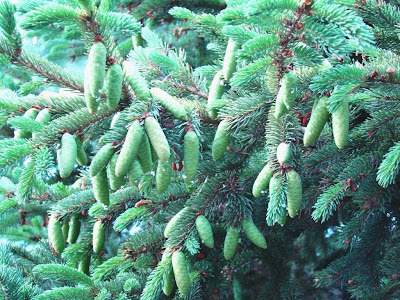 Every fir tree, native or planted, is heavy with cones. Presumably the spring weather conditions and perhaps the milder winter combined to produce this bumper crop. I haven't yet heard how the cone crop is doing further to the north. Its success or failure will determine if many or any of the winter finches that thrilled us last winter will return in the upcoming winter. But if the northern cone crop isn't a good one this year, it sure looks as though the northern visitors will have plenty to eat whenever they get here. 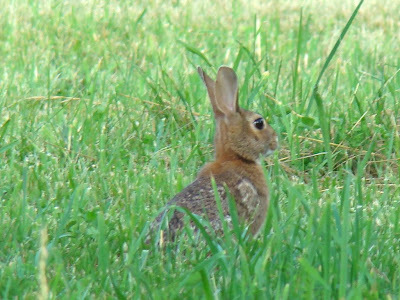 Cottontail rabbits are common around the cabin, but this year they seem even more numerous than usual. It’s typical to see 6-8 of them right now on every walk with the dogs, much to the delight of the dogs. Most of these will likely be dead by fall. Everything from mosquito-borne disease to predation to accidents will reduce their population substantially by late summer. In the wild, few live longer than a year, with annual death rates estimated at 75-80% of the population. Their lifespan could be 3-4 years but that rarely happens. Rabbits are mostly nocturnal, and I most often see them in the early morning and late evening. They like to hide in brushpiles and will eat a wide variety of vegetation, consuming about 40% of their 2-3 pound weight each day. This morning Dog and I walked up very close to one before it spooked. I didn’t see it before it ran, and I don’t think Dog did either. When it took off, so did Dog. Rabbits normally have a zig-zag escape pattern. This one had more of a circle, which meant Dog circled me several times while chasing the rabbit, an event of historic importance in his life. The more usual pattern of our rabbit encounters is that a rabbit takes off, Dog runs to the end of the flexi-lead, nearly pulls my arm out of its socket and rabbit disappears into the brush. Since this rabbit circled, Dog kept chasing for seconds longer than usual, and the best part of all, is that my arm remained securely in its socket. I’m pretty sure the rabbit circled me about three times. Eventually, of course, the rabbit did disappear into the brush, but by then Dog was running out of steam so no arm jerking came at the end of this encounter. He sure was one happy Dog, though. Today’s photo is not going to be the most interesting one you’ll see today. I’m okay with that. For me, though, the view in this photo is one I look forward to every morning. The cut from the power line is the first view of the sky I see each morning. Now that the forest is so dense with summer’s leaves, I can’t see the sky at all until I’ve walked out my driveway and down the lane to reach this cut. In winter, I can see over to Nell’s Hill from my cabin, but this time of year I can only see this little sliver of it through the power line cut. 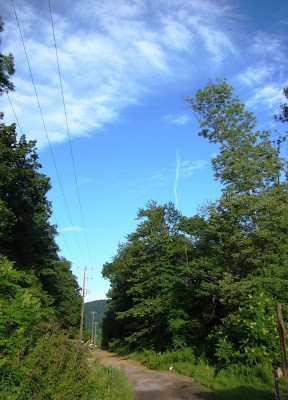 This power line is what brings electricity to my cabin and to my two neighbors and to Ski Roundtop. Because there’s no road of any kind along our power line, I am very subject to losing power because some tree, of which there are thousands, between here and Nell’s Hill has fallen on it. In winter, when there’s snow or ice, even getting to the troubled spot can take hours, let alone clearing the trouble once it’s found. Even in summer, especially at night, I pretty much know nothing is going to be done until daylight. The only vehicles that can reach much of the line are those little maintenance vehicles called ‘Gators, which are kind of like overgrown golf carts. It's not much of a stretch to say that my power hangs by a thread. Or more precisely, by two threads. Perhaps it's because of this that I am overly sensitive to just how dependent the whole of our modern civilization is on things that are as fragile as two thin wires trailing through a mile or so of forest. For me, so much of it feels intensely personal. Whenever a grocery store relies on apples shipped in from Guatemala, say, we are relying on the use of oil to get them here. Whenever a factory moves to China, we are relying on oil to be there to ship it across the ocean. What will happen to us when the thread breaks? You know it will break. It always does, eventually. And the result will be far worse than just a night or two without power. Summer is here now in all but its official arrival date. Summer’s humidity now turns the distant views bluish with water vapor. The quality of a morning’s sunlight is strong and golden, a far cry from the pale shades of winter. I suppose you could say I am resigned to winter’s end for the next 187 days. But make no mistake. Winter is coming. In the meantime, I will try and enjoy the season that surrounds me this morning. I will certainly enjoy the fresh foods of the growing season. And the longer hours of daylight. In the mornings I awaken now before the alarm rings, waking slowly as the light of the new day gradually fills the sky and my bedroom. In winter, when it is still night when the alarm goes off, my awakening is usually harsher. I will likely never get used to or learn to appreciate some of the bugs of summer, however. Right now, the bane of my morning walks is deerflies. And it’s not just me that they bother. They bother Dog and they bother the deer, too. They lie in wait for Dog and me to walk by on our morning walks. When we pass, they ambush us and buzz around our heads in circles, sometimes alighting several times before biting. And when they do bite, it hurts. The same fly might continue its mad circling as we walk for half a mile or more, until we reach an open spot where they finally leave us alone. The deer are annoyed by them too. In the past few days I’ve seen more deer than I’ve seen in the past several weeks. At midday the deer are standing in a field or a clearing or even the middle of the road. Just standing, switching their too-short tails, waiting for the flies to return to the forest and leave them alone in the open for a few minutes. I try appreciate their niche in the world—providing food for a variety of larger creatures like birds and fish, but some days that’s kind of difficult. Some anecdotal, homegrown research into how to avoid these creatures suggests they are especially attracted to the color blue, perhaps because it contrasts with the greenery. I’ve given up wearing blue in the woods at the moment, in hopes that it helps, though I can tell you that avoiding blue is not a cure all. June is typically the worst time for them in this area. They are also more common on warm, sunny days with little wind and they are attracted to motion, especially walking-speed motion, which is unfortunate for Dog and me. I guess you could say that one more good thing about winter is that I don’t have to worry about deerflies. Winter is coming. I know it. Ah, the difference of a day! The heat wave has broken, and this morning the temperature is pleasant again. Last night storms slammed across the mountain, with the worst of them fortunately missing the cabin. Still, it was enough that the sky over my roof turned pink, and Dog hid behind the fireplace. Fireflies now dot the forest at night with their tiny bursts of light, though not as many as I expect to see in another week or so. The honeysuckle are blooming, as you can see in today’s photo. The scent as I walk past makes me want to sit here and do nothing but smell that aroma all day long. 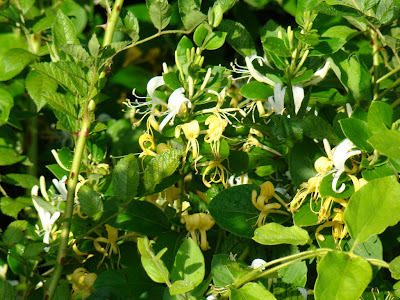 I wonder if it’s possible to overdose on the scent of honeysuckle? I’ve found the first abandoned bird nest of the season, empty and likely knocked down by last night’s winds. I found no sign that it was occupied at the time of its falling. It was a large nest, lined with a thin layer of mud, though well supported with twigs in the usual style. It might have been the nest of a red-winged blackbird, as the size seemed about right, and they are known for lining their nests with mud. I had planned to recover it and photograph it, but as soon as I bent to look at it, Baby Dog rushed over and stepped on it. So much for that idea. Ah, the heat! I’m a creature of winter, not of summer. Having what is essentially an August heat wave in early June terrifies me. Normally, I get through summer by pretending to ignore it, by holding on to spring as long as I can and then seeing signs of fall in the teeniest, tiniest little things. When I imagine three more months just like the past three days of unremitting heat and humidity, I am ready to jump ship, though to where I have no idea. Dog and Baby Dog loll around the cabin, enlivened only briefly when I drop a few ice cubes in their water dishes. Now that winter is over, really over I should say, Baby Dog is back to staring at the spot where she saw one of the red foxes last year. For a moment or two, the fox stared at her and she stared at the fox, separated by perhaps 30 yards or so. For the rest of the summer, she couldn’t pass that spot without stopping and staring at it. I thought she was finally over her obsession, but no. She kind of ignored the spot during winter but now the spot looks the same as it did last June when she first saw the fox. This brief moment was obviously a high point of her life, and she just can’t let it go. As to the foxes themselves, they were vocal this morning. The female has a den (and likely several kits) somewhere in a shallow cut where a seasonal stream runs off the mountain about 100 yards from the cabin. Their barking reminds me of how many couples use a cell phone. "Where are you?" the female barks. The male barks back, and the female knows the male is down around Beaver Creek somewhere. Towards dawn, the back-and-forth barks are nearly continuous, the one constantly telling the other where he is, the female calling him home. Sometimes my dogs join in the barking, though it’s debatable whether Dog and Baby Dog recognize the sounds as anything other than as Something That Must Be Barked At. Fox barks don’t sound like dog barks. They are very hoarse sounds, with more breath than sound, more like a snort or a cough than a bark. Still, the sounds are loud and carry through the quiet forest. When the windows are open, the sound in the pre-dawn hours can wake me up. Once this weather breaks, now that the fox kits should be approaching two months old, I am tempted to wander down to the area where the den is and see if I can find the little ones. But not today. It’s too hot. Another Day. Another Snapper ...or is it? This morning as I was heading down the lane and towards the city, I found this snapping turtle near one of the ponds at Roundtop. Another day, another snapper. Then I looked more closely at it, and I started to wonder. 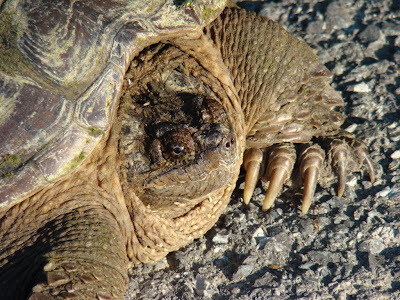 Could this be the same snapping turtle I saw several days ago out along the public road? It's possible, though I can't be sure. This snapper is certainly of a similar size as the first, and as the turtle might crawl, it's probably only 2-300 yards in distance away. 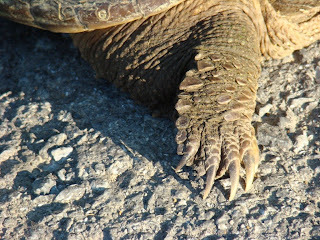 On the close-up view, the scales on the snapper's foot show up nicely, as do those impressive toenails! In other news around the mountain, summer has arrived and settled in with all the grace of a bull in a china shop. Last week I was still wearing a sweatshirt, at least in the mornings. Yesterday it was 96 degrees, which is not quite a record. I looked up the record and found that in 1925 this week in June was a long stretch of 99 degree temperatures, which makes me very glad I wasn't around then to feel it. This is more than bad enough. Fireflies made their first noticeable appearance over the weekend, perhaps a bit later than usual because of all the rain I had just the week before. The forest itself is also changing and moving deeper into the hot season. 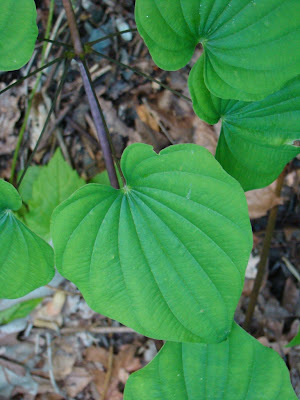 The bright green leaves of early spring are deepening towards the rich shade of mid-summer. The change is not yet complete, but that first burst of bright, eye-popping green has already passed. I must say that I wasn't out and about as I usually am over a weekend. Dog, Baby Dog and I spent much of the time trying to catch a breeze that was more of a hope than an actuality. Summer’s lush greenery has been dancing before me in all its variety this week. Each plant species has a leaf that uniquely its own, and I am finding the shapes and textures of those leaves somehow more astonishing than I remember. Summer’s heat and humidity can make me yearn for the chill of a good winter or the briskness of fall. When I’m not careful, the summer weather can get in the way of my explorations in nature. This week, before the heat overwhelms me, I am struck by this greenery, each so different, like the snowflakes of summer in a way. All green, each so different. This does not appear to be a multiflora rose. This rose is distinctly different than that plant, which is an invasive species. However, I can't tell you exactly what this species is. The other native rose species for which I can find photographs or that are detailed in fieldguides all seem to produce single flowers, not the flowered clumps like this one. 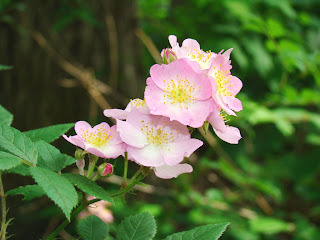 This week I was able to look at both this rose and the multiflora rose, and listed are the most obvious differences. 1. The flowers of this rose are quite pink. The multiflora rose is white, with just the palest tinge of pink. 2. The leaves of this rose are a darker green, by at least a shade or two, than the leaves of the multiflora rose. 3. The thorns of this rose are just like the thorns of cultivated roses, not like the thinner thorns of the multi-flora rose. 4. The leaves of this rose are more distinctly veined and perhaps a bit smaller than the multiflora rose. 5. The scents of the two are slightly different. 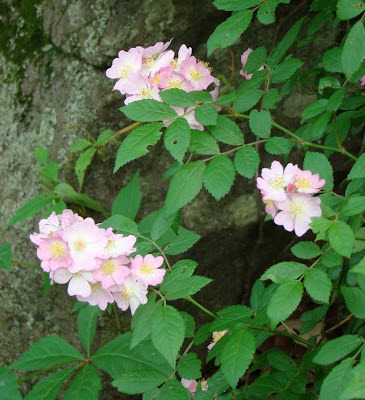 This plant has a scent that is more like a cultivated rose--it's more "rosy" than than the multiflora rose. I suppose it is possible that this is a different variety of multiflora rose, though I hope not. No one near me grows cultivated roses either, so I can't imagine that it's an escape. Is it possible that it is a cross between the white multiflora rose and a wilder or a cultivated species? I don't know the answer to that one either. All I can say is that there are a lot of differences between the multifloras and this plant. 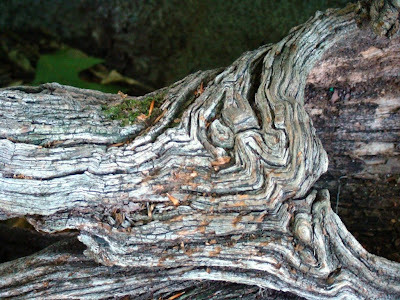 I just love the pattern in this old log. It’s almost like driftwood. I’m guessing that it was more than 10 years ago that I found it and dragged it down from the top of the mountain to the cabin. It must have weighed 50 pounds then. I was younger and I remember it as a hot day, though it may only have been all that dragging. For a while I cradled it and carried it but couldn’t do that for long. Eventually I just dragged it out of the woods, across a ski slope, through more woods and eventually to when my lane dead ends. After all these years, it’s much lighter now, not more than 20-25 pounds, I’d guess. Rain and fungus and who knows what else have worn it or chipped it away. I can’t even begin to guess how many years it has been since it was a living tree. For many years I used it on my back deck like a bird feeder, to the especial delight of various woodpeckers. The hollow area is really the underside of the former branch. I turned it so the hollow side was facing up and filled it with bird seed and suet. Eventually the log eroded to the point where it would no longer stand on its own on the deck, so I moved it. For a few years now I’ve filled the hollow part with soil and used it like a natural planter for my annual plants, holding it up by bracing it with a few stakes in the ground. This year I didn’t even do that, as one side of my "planter" has eroded to the point where I can no longer fill it with soil. Now it’s just a decoration. The wood pattern gets prettier, I think, as the log gets ever older. 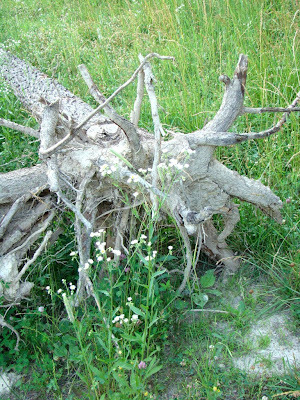 At this point, I’m beginning to think some part of the this dead log will outlast me. Who knew that it would take so long for a downed branch to disappear back into the soil from whence it came? I know I sure didn’t. 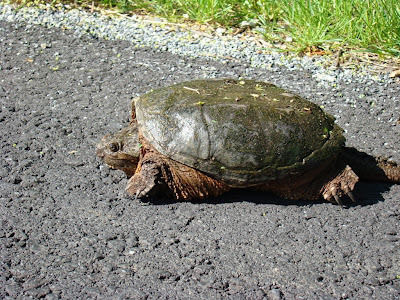 Two days ago as I was driving back to the cabin, I saw a large common snapping turtle along the edge of the road. So why is it that my photos look as though this turtle is such a wimpy little thing? Okay, so it wasn’t the biggest snapping turtle I’d ever seen in my entire life, but I’d say it was a good 14-16 inches long. With snapping turtles, I don’t want to get too close to measure them properly. Usually snapping turtles aren’t found very far from water. This one was as far from water as I’ve ever seen one—perhaps 150 yards or even somewhat more. This one is likely on her way to lay eggs—it’s that time of the year. They tend to wander around away from water as they look for egg-laying spots. Although most of my readers likely know this, in case someone doesn’t, let me state now that it is NOT safe to pick up a snapper by its tail. That’s a fast way to get bitten and to injure the turtle, too. Snappers can bite through a broomstick, so you do not want that to happen to a finger or your arm. Their necks can stretch at least halfway back the length of their shells. If you have to move one—this one conveniently moved itself off the road after a few minutes—the best way is to scoop it onto a shovel, preferably a large shovel like a snow shovel. This turtle was quite benign for a snapper. She didn’t strike at me once, though she eyed me suspiciously. I’ve had snappers snap at me from several feet away. I usually give them as wide a berth as they want. Nina of Nature Remains also found a snapping turtle a few days ago, if you want to check out hers. Cathy of The Quiet One had a bruin visit at her bird feeder this week and got some great photos of that bad little boy with his hand in the cookie jar, so to speak. 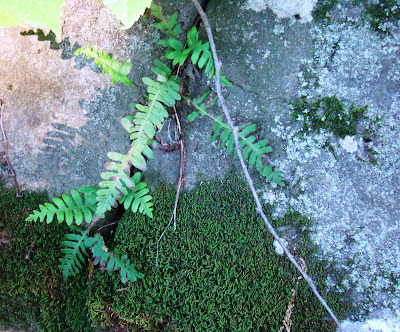 See how this fern is draped along the crack of this boulder? That’s one of the ways to identify it. The fern is a common polypody, and they make a living out of inserting themselves into places where other plants aren’t interested in growing. Their name means "many footed." Other names for them are rock polypody, rock cap fern, Virginia polypode and in Quebec tripes-de-roches. A newly described polypody that’s very similar to the common polypode is now called Appalachian polypode. This does not seem to be that species, which is described as having the middle of the frond slightly wider than the base. This fern is also evergreen, a fact to which I can attest, as I see this particular fern every day and have for at least a few years. In winter, it’s one of the few spots of green in my otherwise brown (or white) landscape so I always make a point of looking for it. I have tried to photograph it many times, and so far I haven’t been satisfied with a single photo, including this one. It’s a small fern, and when I’m far enough away so you can see the interesting rock around it, the fern doesn’t show up very well. When I’m close enough to get a decent photo of the fern, the rock isn’t visible. First, let me say that I’ve always preferred the black vulture to the turkey vulture. I think my bias is simply based on how they fly. To me, turkey vultures always look as though they are about to fall out of the sky, rocking back and forth like a kid trying to walk on a fence. Black vultures know how to fly. The first time I remember seeing one in Pennsylvania was on Hawk Mountain, perhaps 20 years ago. As I recall, it was a slow day, early in the fall season and hawks were in short supply. So, as is common at such times, rather than scanning an empty sky, I was talking to someone, probably catching up on what we’d both been up to since we last saw each other. I remember someone yelled "immature bald eagle"—a conversation stopper if ever there is one. I turned and started scanning the sky, looking past the vultures overheard and not seeing anything that resembled an eagle when the counter calmly told the person who was pointing frantically at a large bird overhead, "that’s a black vulture." And then I realized that the black vulture overhead did, sort of, fly a bit like an eagle. At least, it didn’t fly at all like a turkey vulture that holds its wings in a characteristic v-shape. By comparison, the black vulture holds its wings flat, like an eagle. The person who’d called "eagle" and who had never seen a black vulture before made the ID based on the flat wings and the bird’s color, figuring that since the bird obviously wasn’t a turkey vulture, it obviously had to be an eagle. Since then, the ever-warming climate has made the black vulture a fairly common visitor to my area. They are still no where as common as the turkey vulture, but their numbers increase. If I had to guess, I’d say I see a pair of black vultures for perhaps every 30 turkey vultures I see. Black vultures are different from turkey vultures in a couple of interesting ways other than just in the color of their heads. They are slightly smaller and are considered to be "more social." 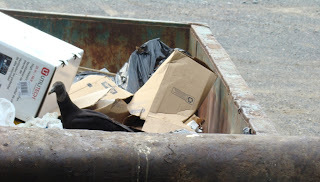 I would say that if you see one black vulture there is almost certainly a second or even more. Whether these are paired birds or pairs with young, I don’t know. But two together are almost always a given. 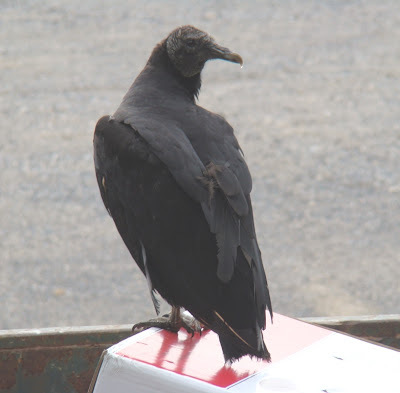 Another interesting difference is that while turkey vultures find their dinners based primarily on smell, black vultures, perhaps including the one in today’s photo, find their dinners primarily by eyesight. Further south, where black vultures are more numerous, their social nature could also be termed "pushy," as they have been known to force turkey vultures away from a meal simply by their overwhelming numbers. Our new world vultures are quite a bit different from their old world cousins. There, vultures are more raptor-like and have raptor-like feet and beaks. Our vultures have chicken-like feet, more adapted to running than tearing dinner apart.